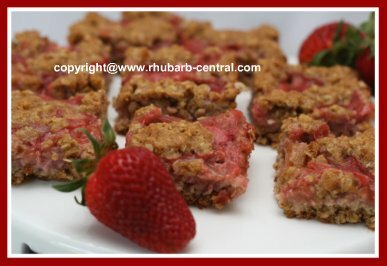 I made this Recipe for Healthy Rhubarb Bars with Strawberries today and this easy rhubarb recipe turned out amazing! My family agreed that they were so very scrumptious! And they are healthy too! 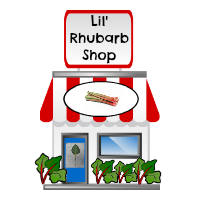 These bars can be served as a finger food snack, or served on a cake plate with a dollop of whip cream, or whipped dessert topping and sliced strawberries ... yummy! 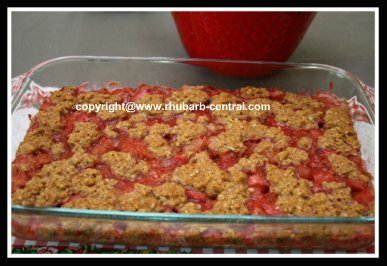 In a pan, not covered, bring the sliced strawberries, the chopped rhubarb, the honey, the corn starch and the water to a boil over medium high heat. 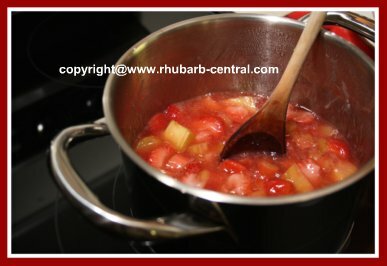 Immediately turn down to low heat, and, (with the lid partially on), allow the mixture to simmer for about 15 minutes, or until the strawberries and the rhubarb are tender and the sauce has thickened. 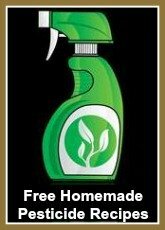 Stir often to avoid sticking and burning! In a small bowl, lightly whisk the egg, and whisk in the melted butter, maple syrup and the milk. In another, larger bowl, combine the oats, whole wheat flour, brown sugar, baking soda, and the salt. Pour the wet ingredients into the dry ingredients and mix to combine. Reserve 2/3 of the dough, and press the remainder of the dough into the bottom of a greased, (I like to use the non-stick cooking spray), 9" x 13" baking dish. Spread the cooled filling over top of the dough, and then crumble the reserved dough over the top. 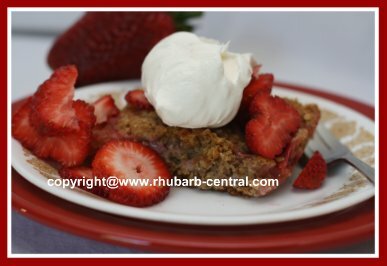 Note - the dough is a "wet" crumble, it does not have a dry texture to it. 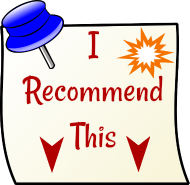 Bake at 350° F for about 25 minutes, or until the crust is firm, and browned. Cool, and cut into bars or squares. 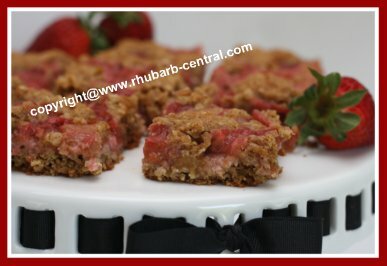 Serve these rhubarb bars as a finger food snack, or on a plate with whip cream and sliced strawberries. 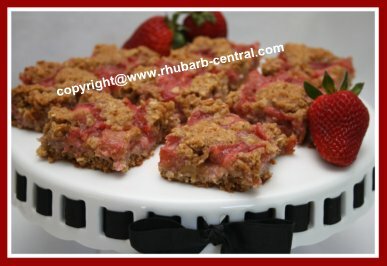 This is especially a great way to serve the bars as a dessert (see image below). ~ Simply D E L I C I O U S ! 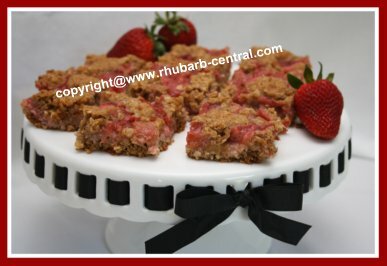 Yummy Rhubarb and Strawberry Bars! Do you love beautiful cake and pastry stands like I do?